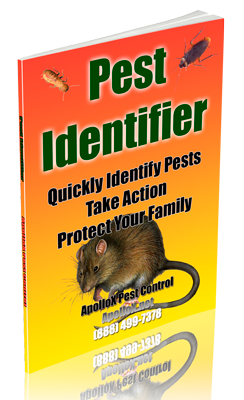 ApolloX Pest Control will remove termites from your home quickly, efficiently, and safely. The termite colony has three primary castes: workers, soldiers, and kings, queens, and secondaries. Workers are creamy white, and seldom seen unless a termite tube or infested wood is broken open. Soldiers have elongated yellowish heads with large jaws and are about the same size as the adult worker-a quarter-inch. Kings and queens are dark-brown or black and about 3/8 to 1/2 inch long. They have two pairs of translucent wings of equal length, which break off shortly after swarming. Very often their shed wings are the only evidence that termites are in a building. Secondaries are supplementary reproductive females that occur in mature colonies under favorable conditions. Wood attacked by termites has runways or passages that are coated with an earth-like material glued to the wood. Where the wood has been infested for some time, it may be largely hollowed out with passages and may be rotten in appearance. Another sign of termites in the house is the presence of termite tubes. Termites make these earth-colored tubes for a number of reasons, primarily as a protected runway from the earth to the wood they feed on. Look for these tubes on the cellar walls, on wooden posts, wall studs, mudsills, and door and window trim. Wood embedded in earth or in concrete cellar floors is especially susceptible to termites. Termites Pest Control: Are they Ants or Termites? 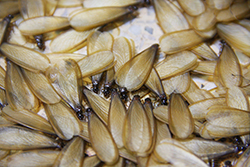 The first indication of termites is often a swarm of winged insects. Winged ants also swarm, and look similar to winged termites, but the termites are the ones that cause the real damage, so it’s important to differentiate between the two. The easiest way to distinguish between ants and termites is to look at their waists. An ant has a narrow, wasp-like waist; a termite has a broad waist. The antennae or feelers of ants are L-shaped, whereas those of termites are straight. Furthermore, the four wings of termites are of equal length and nearly twice as long as the termite body, while ant wings are approximately equal to the length of the ant, and the fore and hind wings are of unequal length. Subterranean termites live in underground colonies or in moist secluded areas above ground that can contain up to 2 million members. They build distinctive “mud tubes” to gain access to food sources and to protect themselves from open air. They need contact with the soil to survive. They can build tunnels through cracks in concrete. 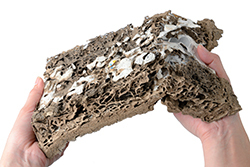 Termites feed upon old roots, tree stumps, fallen tree limbs and branches on the ground, and similar materials. In buildings, they feed on cellulose materials, such as structural wood, wood fixtures, paper, books, cotton, and related products. 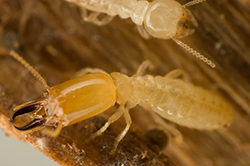 Termites are social insects and the specialized castes in the termite colony each perform specific functions. Workers feed on the wood and cause the real damage. Individual workers are believed to survive for up to five years. Soldiers, fewer in number, must rely on the workers to feed them. Whenever the colony is invaded or a hole is made in a tube or piece of infested wood, the soldiers will use their jaws to defend the breach. Kings, Queens and Secondaries have the function of breeding and reproduction. During late winter or early spring, swarms of the reproductive caste may be noticed in infested buildings. After crawling or fluttering about for a short time, the termites break off their wings and locate a mate. Each pair attempts to locate moist wood in contact with the soil to start a new colony. 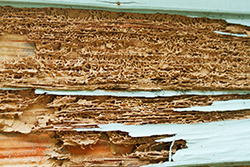 Termites can collapse a building entirely. The hard, saw-toothed jaws of termites work like shears and are able to bite off extremely small fragments of wood, one piece at a time. When damage to the structural timbers of a building becomes evident, it is usually the result of years of infestation. Thus, damage by termites is not a sudden onslaught that will cause a building to collapse in a few days. 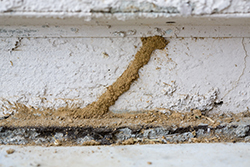 Generally, termite problems only occur some years after construction – usually 10 years or more. 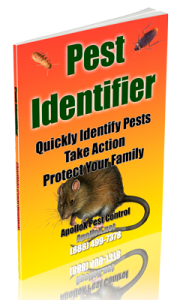 Call ApolloX Pest Control for termites pest control in the Fairfield County CT towns of Fairfield, Black Rock, Bridgeport, Cos Cob, Darien, Easton, Greenfield Hill, Greenwich, New Canaan, Noroton, North Stamford, Norwalk, Old Greenwich, Redding (lower), Ridgefield (lower), Riverside, Rowayton, Shelton, Southport, Stamford, Stratford, Trumbull, Weston, Westport & Wilton.